We have noticed odd dumbbell shaped objects hanging off light poles or power lines upon occasion. What can they be? Could it be Surveillance equipment from alien beings? It turns out they are called Stockbridge Dampers and they are basically counterweights designed to offset the effects of high winds on tall structures like light and power poles. These poles can be weakened by oscillations from the natural movement of the structures in the wind. 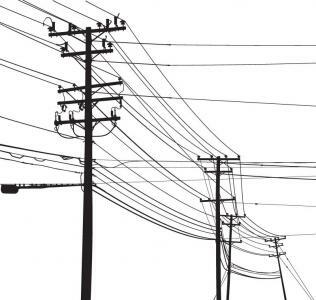 Since power poles are stationary and wind currents tend to come from the same general direction, the structure of a light or power pole can be weakened because the material fatigues in the same place with every wind gust. So what does the dumbbell do? The two weights on the end shake in opposing directions, dampening and spreading the vibration throughout the structure and therefore protecting it from fatigue. We know a few bankers who are struggling with fatigue and therefore could probably use a Stockbridge damper to offset recurring industry vibrations. There is probably no one more fatigued at this moment though, than our customers in and around the oil industry. We all know that prices at the gas pump have declined and everyone agrees it is nice to save a few bucks when we fill up. What is not so nice is the effect this is having on employment and economic activity in a large swath of the US. Oil prices that appeared to have stabilized around $60 a barrel for several months have now taken another notch down, losing 20% in the month of July with the price of West Texas Intermediate now below $46. Last Friday, some of the biggest oil companies reported earnings, with ExxonMobil reporting an earnings drop of 52% in spite of increased production. Exxon is viewed as the best insulated from the price crash, but still reported its worst quarterly profits since June of 2009. The drop in crude oil prices has resulted in the loss of around 70K jobs globally and has caused more than $200B of new oil and gas projects to be shelved. Royal Dutch Shell announced 7K job cuts and plans to cut capital spending by 20%. The supply glut has come about for a number of reasons, especially because US shale production has ramped up in the last few years. OPEC determined not to cut production in an effort to squeeze out higher cost producers and especially to cause American production to decrease, but for the most part, this has not occurred. US shale production has remained resilient and now with the possibility of Iranian oil coming onto the market in the months ahead, oil is likely to remain oversupplied. The Economist estimates that the price of West Texas Intermediate could rise to $66 by 2019. Saudi Arabian producers can make a profit at around $20 a barrel, but the US Oil Shale Belt needs around $100. More difficult extraction areas like the Canadian Tar Sands require more to make a profit. Until now, reduction of production and staff has been somewhat moderate, but clearly, prices this low for many years are likely to remake the industry. There will be opportunity for banks in the reinvention of the oil industry, but there is danger for those who lend to current exploration and production firms. Banks with these loans on their books have already been warned by their regulators to take extra care. Consumer lending in oil producing regions will also be affected and alternative energy companies may suffer as oil remains cheap. You may want to present your beleaguered oil industry customers with a Stockbridge Damper to hang around their necks, at least until the wind changes direction for that industry. In the meantime, take extra care with your bank's customers in the oil patch to avoid regulatory wrath and credit losses later on. Treasury yields rose 6 to 8bps as commentary from FOMC members indicates a Sept rate increase. Mortgage applications and ADP private sector employment will be reported. 1) Regions Bank (AL) will acquire employee-benefits and insurance company A.I. Group (GA) for an undisclosed sum. 2) First National Bank of Pennsylvania ($16.1B, PA) will acquire Metro Bank ($3.0B, PA) for about $474mm in stock. 3) Lakeland Bank ($3.6B, NJ) will acquire Pascack Community Bank ($394mm, NJ) for about $43.8mm in cash and stock. 4) MutualBank ($1.4B, IN) will acquire the trust business of First Bank of Berne ($551mm, IN) for an undisclosed sum. The FFIEC announced regulators have a cybersecurity tool to assist senior management and boards in assessing and managing bank cybersecurity risk and preparedness. The tool helps identify inherent cybersecurity risk and address the institution's maturity of cybersecurity preparedness. Fed St. Louis President Bullard said he still wants to see a rate hike at the Sep FOMC meeting. SNL Financial reports the median asset base of targets so far in 2015 has been $134.4mm through July 29 vs. $156.9mm in 2014 and $163.0mm in 2013. The NH Banking Department has granted a license to Primary Bank to begin operations in the state. This is the 2nd bank chartered since 2010. 1) Valley National Bank ($19.0B, NJ) will close and consolidate 13 branches in NJ and NY (about 6% of total network), as it seeks to improve performance. Wells Fargo said it will no longer have referral arrangements with mortgage marketing services or real estate firms given increased regulatory scrutiny and the risk of fines. A report by the Fed indicates regulators see heightened risks at community banks related to credit risk, interest rate risk, concentration risk and cybersecurity (at all banks).